Mul­ti­ple expo­sure allows you to record two or more dif­fer­ent scenes on the same frame of film or on the same dig­i­tal file. You must make sure that your cam­era can do this, and you must read your instruc­tion man­ual to dis­cover the set­tings that con­trol mul­ti­ple expo­sure for your par­tic­u­lar cam­era. Most older man­ual cam­eras as well as most medium to higher end dig­i­tal cam­eras are capa­ble of pro­duc­ing mul­ti­ple exposures. If your dig­i­tal cam­era can take mul­ti­ple expo­sures you will find that it can pro­duce very artis­tic results quite eas­ily. Usu­ally you have to go into the camera’s menu set­tings and select mul­ti­ple expo­sure as well as select how many expo­sures you’d like to make/take. Many cam­era mod­els will have an ‘auto-gain’ field and you will have to choose on or off. The auto gain (when set to ‘on’ ) blends the expo­sure infor­ma­tion for each frame that you take to give you 1 prop­erly exposed dig­i­tal file made of 2 or more expo­sures. Each expo­sure that you make con­tributes to the final expo­sure equally. 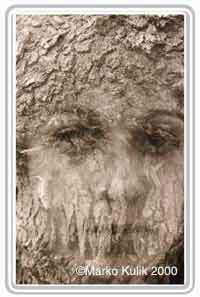 If we take the image that accom­pa­nies this arti­cle for exam­ple, we can see a face in a tree made from 2 images. With the auto-gain set to on, the face gets exactly half the expo­sure and the tree the other half. If you are happy with that, you are golden. Let’s say that you want the tree darker than the face though, that’s where it gets trick­ier. When it is only 2–3 mul­ti­ple expo­sures you can use expo­sure com­pen­sa­tion in the semi-automatic modes or work in man­ual mode and tweak how much expo­sure each frame gets that way. But once you are at 4 or more expo­sures it can really get con­fus­ing to add dif­fer­ent lev­els of expo­sure com­pen­sa­tion on each frame. In these cases it might be more pre­cise to set the auto-gain to off and fig­ure out how much ‘weight’ each of the mul­ti­ple expo­sures should con­tribute to the final exposure. When the auto-gain set to off, you the pho­tog­ra­pher have to fig­ure out the math and make expo­sure adjust­ments to blend the 2 or more sep­a­rate expo­sures. If you don’t do the math and make adjust­ments, you will sim­ply be adding expo­sures one on top of the other and the final image will be over­ex­posed. The more mul­ti­ple expo­sures you make with­out adjust­ing the expo­sures, the greater the over­ex­po­sure on your final dig­i­tal file. That said, for those that want to do the math, each of the expo­sures you make can be fine tuned in order to get a greater degree of pre­ci­sion. Use Method A below for film cam­eras to help fig­ure this out for your dig­i­tal cam­era, the math is the same. Basi­cally the for­mula is like this. Each of the mul­ti­ple images on your frame of film becomes a frac­tion of the total expo­sure of the frame. So for instance, the shot in this arti­cle is made up of 2 images, a model and a tree. The expo­sure for the model as deter­mined by the camera’s meter was 1/60 at f-8. The expo­sure for the tree was also 1/60 at f-8. Now because you’re putting another image on the same frame, each image should be exposed at half the total exposure. There­fore to put half of the tree, I shoot the first expo­sure at 1/125 of a sec­ond, (this lets in half the amount of light as 1/60). Then I shoot the next scene, the model, ON THE SAME FRAME OF FILM-CONSULT YOUR MANUAL TO LEARN HOW TO DO THIS. To shoot the model I also expose the film 1/125 of a sec­ond. If the cam­era meter had given a dif­fer­ent expo­sure for the model, say F-8 at 1/125, I would have needed to HALVE that expo­sure and I would have used F8 at 1/250 (which lets in half as much light as 1/125) Alter­na­tively I could have adjusted the aper­ture to let in half as much light, in which case the expo­sure would have been F11 at 1/125. Now that you under­stand the the­ory lets make it eas­ier. There a a few ways to play with expo­sure. One of the eas­i­est ways is by chang­ing film speeds. Read The Trin­ity of all Pho­tog­ra­phy to under­stand why. If the ISO on the film box says 100, at ISO 100 you can expose 1 frame cor­rectly. But at ISO 200.… you can expose 2 frames cor­rectly since each frame of film is get­ting half the rec­om­mended expo­sure! At ISO 300 you can expose 3 frames cor­rectly etc. In the model/tree exam­ple, using method B all I would have done was set my 100 film to 200 and shot each scene at the cam­eras RECOMMENDED expo­sure. So.…before you take your shot, deter­mine how many mul­ti­ple expo­sures you will take, and set the ISO accord­ingly. One caveat.….MAKE SURE YOU SET THE ISO BACK TO ITS ORIGINAL SETTING AFTER THE MULTIPLE EXPOSURE SHOTS. Cre­ative tip: Most mul­ti­ple expo­sure prints look busy and abstract if too many expo­sures are used. Try using two or three to start. Then experiment.…and use as many as you like.